The wind was blowing. The graceful petals of the cherry blossoms were dancing like snow flakes. Suddenly, she got closer to him and he fell into her jet black eyes. He thought that his spell started to take hold. Her beauty was unique. Despite feeling guilty, he kissed her. Encens Jinhae goes on smelling of pale lemon and pink pepper (a chalky and dry opening). Next up is faint nutmeg and super-soft, floral incense ash (I just realized I know nothing about Korean incense and must remedy that soon). Encens Jinhae's restraint continues in the dry down where brittle rose petals mix with pale musk and sheer/scorched woody notes. 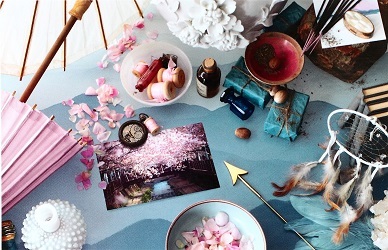 I fancy myself an expert on the scents of plum and cherry blossoms, and Encens Jinhae comes up short in the re-creation of cherry blossom scent (if re-creating that aroma was one of Atelier's goals). Encens Jinhae underwhelms me from start to completion as an incense and/or floral perfume; its thin, washed-out, department-store character is a disappointment, and its price is a shock. "Despite feeling guilty, I kissed my Encens Jinhae sample good-bye." Atelier Cologne Encens Jinhae is available in 30 ($130), 100 ($250) and 200 ($325) ml Cologne Absolue. For buying information see the listing for Atelier Cologne under Perfume Houses. 1. Listed fragrance notes of lemon, pink pepper, nutmeg, incense, cherry blossom, Turkish rose, elemi, patchouli, sandalwood. I think I’ll pass on this one, don’t know how they can justify the price, this sounds so bland! Mayfly, Atelier usually does better. I liked this a lot on first sniff when I was in the store. I think I got the cherry/plum. I didn’t consider a purchase anyway because of price. But I might have participated in a split. I tried it a couple of times after that and enthusiasm/interest waned. Lizzie…I never noticed the cherry blossom at all…just a hazy floral. $ saved! What a shame..the notessounds like it could have turned out to be an amazing perfume.. But a washed out department store fragrance for that price. I’m keeping my money in the bank. Littlec, yes, save your pennies…but give it a sniff if you encounter it…. I used to enjoy the little stories that Atelier does for each of its releases. In the early days they were terrifically well done. In a few sentences they really did evoke a place, a mood and a narrative. But they’ve become thinner and less convincing over the years. This one is just schlock. ‘He thought that his spell started to take hold.’ Eh … ? Annemarie…too bad my ‘spells’ never seem to work! Yes, I’m imagining an annoying drunken guy harassing the poor Korean gal, and I just want to ask her if everything is ok or if I should call the cops. I can’t keep up with this brand. Really, how many can one perfume house put out in a year! Now that is a bon mot! That little piece of writing is actually kind of creepy to mme, for whatever reason. Excellent review as always, Kevin. I’m not taken with Atelier, although I’ll note that Rose Anonyme is almost as good as BK Rose Oud, and costs a lot less (I’m referring to the original cologne; haven’t tried the new extrait). I may buy No. 16 Tomato Leather; if I do, I’ll try to get a sample of Hay Incense. FYI, Cognoscenti offers nice sample sets. Noz…I’ll check it out, LOVE hay notes. Atelier just doesn’t work for me for the most part and this sounds uninspiring. Too bad as I am on the hunt for flower and incense combos. I’m in love with, and currently wearing, Kimonanthe, which I pursued based on your reviews. The Tauer incense rose combos don’t work for me, but I want more of this flowers and incense thing! Amy, did you get a bottle of Kimonanthe!? I did. I plowed through a smallish decant and then said, what the h*ll. I love the bottle as well as the juice. And it lasts really well on me. Amy: I am now green tinged…enjoy! Sounds completely awful, but Atelier has been churning out some real duds* lately so I’m not surprised. * Apologies to everyone who liked the new clementine one. To me it was like the entire Dillard’s men’s fragrance counter circa 1996, and it would. Not. Come. Off. mm: that was on my to-try list…HA! Kevin – have you tried the Emeraude Agar from Atelier yet? I think it’s the best Oud scent for Oud-phobics! Jack: I don’t even remember hearing about that one! But I’m the opposite of oud phobic…. I’ll put it on the to-try list. I quite like it, it has a brightness to it while still being woody and almost resinous. And its one of the Ateliers that lasts for a good 6-7 hours (really lasts, on me anyway). Good luck!